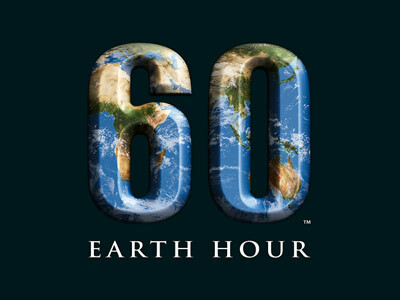 It's Earth Hour 2011 tomorrow, March 26, from 8:30 to 9:30pm. If you still don't know, Earth Hour is an annual global event organized by the World Wildlife Fund for Nature encouraging households from all over the world to turn off their lights for a span of an hour. It aims to turn idea into action: By turning off your light for an hour, you show where you stand on climate change, apart from doing your part in conserving precious energy. A simple yet brilliant movement, we say. In 2010 alone, 126 countries participated in this environmental advocacy event, with plenty of participation and pledges from over 15 million Filipinos. That’s nothing compared to the 90 million Americans who took part in the U.S., but hey, who is competing? It’s all for the better good. It could be a thrill, flashing yourself for everyone to see, except there are no lights and everyone won’t really see you. But still, the feeling of liberation, even if only for a darkened hour. You can dance naked, sing naked, simply sit naked, or try to catch a glimpse of your female friend naked. Do whatever, it’s a naked party. Give yourselves 20 seconds to find clothes before turning the lights on. Marvel at the screams and laughs that go with it. Spend the hour ala-Midnight Society and gather into a circle with only a flashlight to spare. Invest in ghost stories instead of the usual engkantos and tikbalangs because you are, after all, inside a house. Pull a scary prank on your cute friend and apologize after. And if the horror stories get old, perhaps a little spin the flashlight and truth or dare in the dark will do. Kudos to Spot.ph for this brilliant idea. One way to conserve energy is to conserve the noise that comes with it. Invite friends to an hour of silent dance fest – where everyone will bring their own iPod or mp3 players and respectively dance along with it. Each one will only listen to their own play list, waggle around, and watch the others groove in this energy-saving silent disco. A glow in the dark paint, tonic water, and an empty canvass is all you need to pull this off. Paint a tree, paint someone else’s body, heck, here’s your chance to repaint the house. Pimping out your living room wall with artworks could either turn out awesome or downright messy, but you can always try to test your art skills on a plain white t-shirt instead. It’ll do, it’ll do. Find an epiphany as you lay in the dark. Think of any idea; perhaps write a song or a plot for a movie. Take advantage of the silence. Maybe even take a little nap, wake up and write about your dream. Realize anything, take notice of something. Talk to yourself for an hour; practice your curiosity in the dark. Wonder what it’s like to be blind. Smoke a joint perhaps? Just kidding.